Patient Jerry Peppe, 69, underwent a Transcranial magnetic stimulation (TMS) at McLean Hospital. Next to him is Dr. Oscar Moraes. Bit by bit, Ruth Rosenfield stopped feeling like herself. Normally sociable and active, she slogged through each day, struggling to initiate any activity, often seeing no reason to get out of bed. The Stoughton retiree knew what was wrong, because she’d been there twice before: depression. In her previous two bouts, she had recovered with the help of medication. But this time, at age 70, she was stuck. The class of drugs that had worked before were no longer an option, because they could worsen health conditions she had developed. That’s why, last November, Rosenfield ended up reclining in a dentist-style chair, as a device on her head sent magnetic pulses through her skull and into her brain. After three dozen 20-minute sessions, Rosenfield was back to hosting dinner parties — and enjoying them. 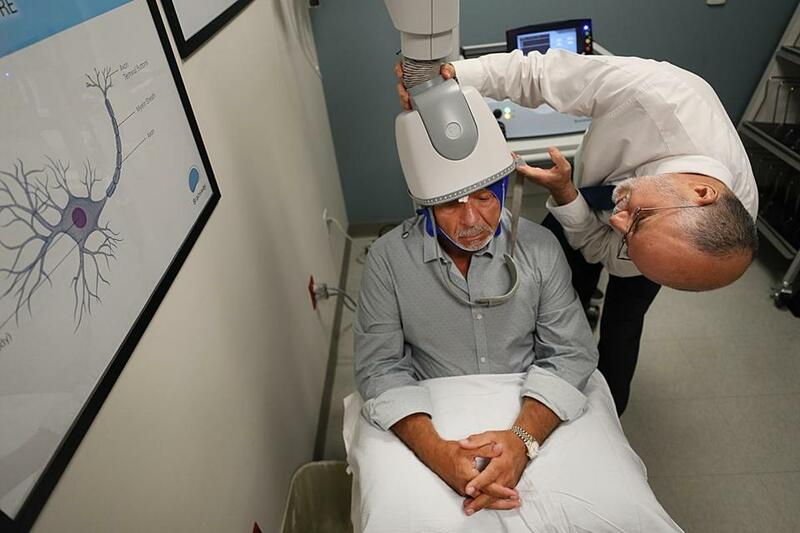 It may sound futuristic, but the treatment Rosenfield received — transcranial magnetic stimulation, or TMS — has been available for nearly a decade and is considered a well-studied, low-risk tool for beating back depression when medications don’t work. And lately, it’s become much easier to get. Once offered primarily in hospitals and at too high a price for most people, the technology is now covered by Medicare and most health insurers, which will pay roughly $10,000 or more for a course of TMS, provided three or four medications and psychotherapy have failed. As as result, it’s feasible for private psychiatric practices to purchase the machines and for TMS-only clinics to spring up. In Massachusetts, for example, 10 private practices — including the one where Rosenfield was treated — have acquired machines from NeuroStar, the leading manufacturer. Separately, a new Western Massachusetts company working with a different manufacturer, Brainsway, has established six TMS clinics just since December. The trend is both welcome and worrisome to Dr. Adam P. Stern, a psychiatrist at the Berenson-Allen Center for Noninvasive Brain Stimulation at Beth Israel Deaconess Medical Center, where TMS has been studied for many years. “I’m a believer in this greater access,” Stern said in an e-mail. But he said there is no system in place to ensure that practitioners are providing effective care — no standardized training program, no accrediting body monitoring how the clinics perform. Meanwhile, the demand for TMS is likely to grow. Researchers are investigating whether magnetic pulses can also ameliorate obsessive-compulsive disorder, post-traumatic stress disorder, bipolar disorder, and other conditions. But after a well-designed government-funded study in 2010 confirmed the treatment’s efficacy, Cochran decided to buy a TMS machine for her practice. Today, she estimates that about 14 psychiatric practices in the Nashville area have TMS machines, roughly 1 to 2 percent. She said the trends are similar nationwide, including one that concerns her: the growth of what she calls “TMS mills” — companies that set up shop only to offer TMS. “Their outcomes are not as good” as practices that also offer other types of mental health care, she said. Most patients continue with medication and psychotherapy along with TMS. In general, Stern said, about 50 to 60 percent of TMS patients experience a significant drop in their depressive symptoms, and roughly half of those people emerge from depression altogether. Rosenfield was in that happy minority. She underwent TMS therapy at Child & Family Psychological Services/Integrated Behavioral Associates in Norwood, a large psychology practice that bought a $75,000 NeuroStar TMS device in July 2016. Five days a week, Rosenfield drove to the Norwood practice and took her place in the chair. A technician positioned a curved device containing the magnetic coil against her head. Foam earplugs in place, and headphones over them, Rosenfield leaned back to watch inspiring TED Talks selected by the practice to keep her awake and uplifted. When the magnet came on — emitting a loud rat-a-tat of 40 pulses in four seconds, followed by a 20-second break — she could feel a light tapping against her head, but it didn’t bother her. Some patients get mild headaches. The worst side effect, a seizure during treatment, is very rare. The pulses, although penetrating less than an inch into the brain, are believed to spark changes in the circuits connecting the brain structures involved in emotion, stimulating the areas that are underactive in depressed people. Rosenfield, a retired apparel sales representative, said her mood started to improve after only two weeks, and she had fully recovered after six weeks of daily treatments followed by three weeks of less-frequent sessions. Seven months later, she still feels fine, and continues working with her psychotherapist. Studies have found that some people remained depression-free a year after treatment. But it’s also common to relapse and come back for additional TMS sessions. TMS is often offered to patients who might otherwise be candidates for electro-convulsive therapy, which induces seizures that relieve depression 80 percent of the time, a success rate unmatched by any other treatment. But electro-convulsive therapy requires general anesthesia, and can cause short-term memory loss. Pottanat and other doctors wish they could offer TMS before subjecting patients to months of medication trials, as insurers require. Stern, the Beth Israel psychiatrist, said some data suggest it would be more cost-effective to do so. Other research is testing whether different protocols, with fewer or shorter sessions, might work as well as the current weeks-long treatment. In the end, though, doctors still don’t know exactly how TMS works, because they don’t know exactly what causes depression, said Dr. Oscar G. Morales, medical director of McLean Hospital’s TMS service. “We don’t know what part of the system is wrong,” he said. Jerry Peppe doesn’t know what caused the depression, part of his life for years, that worsened after he retired and moved to Florida. One day last December, Peppe, 69, called his daughter in a state of such alarming despair that she rushed to his side, and eventually brought him for treatment at McLean Hospital, in Belmont. He attended a day-treatment program, met with a psychiatrist and a psychotherapist, and took medication. Speaking right after his 36th and last TMS session in late August, Jerry Peppe said he’d benefited from all the treatments at McLean. The therapists had taught him skills to keep depression at bay. “I haven’t felt this good in a long time,” he said.